Robbers should not bother on Orange Street. 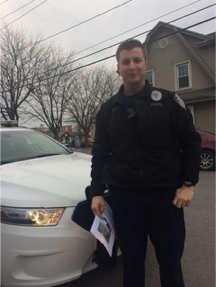 According to Officer Christopher Fortin, Orange Street is safe because everyone is following the law. “No,” Officer Fortin told the Orange Street News when asked if there has been any recent crime. “Don’t break the law and you won’t have any problems,” added Officer Fortin. This entry was posted on January 6, 2015 by Hilde Kate Lysiak and tagged Hilde kate lysiak, Officer Christopher Fortin, Orange Street News, selinsgrove.